Goldline Fiberlite Air curling broom handles are a composite with high strength to weight ratio. 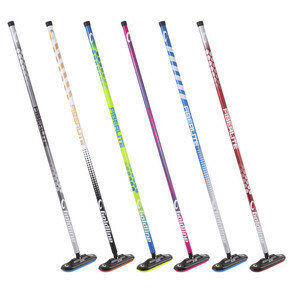 Their light weight and attractive price point make Fiberlite brooms the most popular type of curling broom for the recreational market. Equipped with the innovative Air Head 2.0, featuring a spring lock system for quick head replacement, and a snap system that facilitates quick and easy pad replacement. Includes an Airway pad, the evolution of the renowned Norway Pad. Offers optimal dependability and effectiveness for the recreational curler. The Air Head 2.0 has been approved for use in WCF sanctioned events when paired with an Air Pro pad (sold separately).